Being Frugal and Making it Work is currently accepting product submissions for the 2013 Holiday Gift Guide, so if you have a family friendly product that fits into any of the above categories, please feel free to contact me. The 2013 Holiday Gift Guide will kick-off October 1st and go through mid-December. 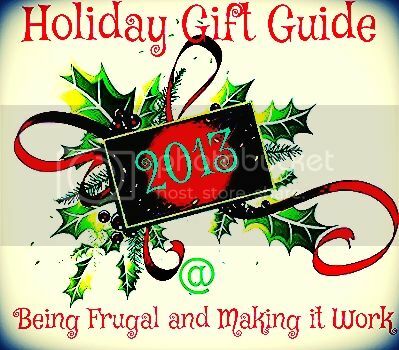 What products would you like to see in the Being Frugal and Making it Work 2013 Holiday Gift Guide? It's hard to believe it's already that time of year again. Good luck with your gift guide! I am starting to work on mine too!! So exciting! I can't believe it's close enough to the holidays to start making gift lists!! Can't wait to see what yours includes this year. I love Gift Guides and can't wait to see yours! I'm definitely looking forward to some recommendations for guys since they are the hardest to shop for. LOL! So fun! I'm almost done with mine this year and it's so exciting! Can't wait to see your guide. I've opted not to do one this year. I love holiday gift guides! I am not a very creative shopper, so i love to look through gift guides for the hard-to-buy-for people on my list.